People are concerned about issues of access, traffic and more, but perhaps the most emotional reason for local opposition is that the site is right against the boundary of the C S Lewis Nature Reserve, a space that is much-loved, even treasured, by local people and admirers of the author and his works from all over the world. 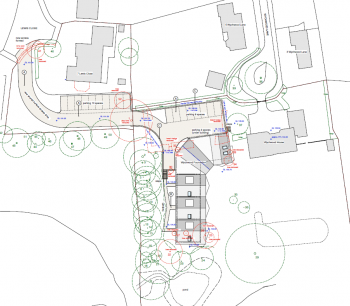 The proposed access road to the buildings starts at the top of Lewis Close directly opposite The Kilns, Lewis’s house in Risinghurst. Despite not being a registered charity the applicants are asking for the statutory exemption available to charities from the CIL contributions developers normally have to pay. The CIL (Community Infrastructure Levy) is the route by which local councils get money for providing infrastructure services (drainage, street lighting, refuse collection etc.) I have no experience of dealing with the Charity Commission, but it seems very unlikely that the Beechers will be able to satisfy the Charity Commissioners of their genuine charitable purposes and achieve registration in time for their application to be dealt with. I notice that a Jonathan Beecher is the Director of Beecher Acoustics Ltd, whose registered address is 1 Quarry High Street. This company says its Nature of Business is “Manufacture of musical instruments, Repair of other equipment, Buying and selling of own real estate” – that last phrase seeming to cover the development in question if it is indeed the same person. The architectural drawings were drawn up by another Beecher based in Edinburgh. 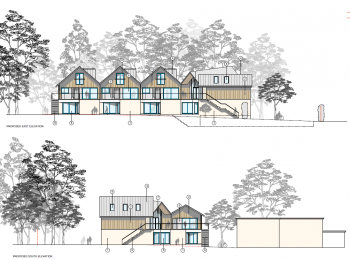 The elevation drawings show a terrace of three storey buildings with steeply pitched roofs accommodating the top storey. The buildings are partially sunk below the ground level of part of the site. I’m sure the plans will be examined in great detail by all those who fear the impact the development may have on the local scene. 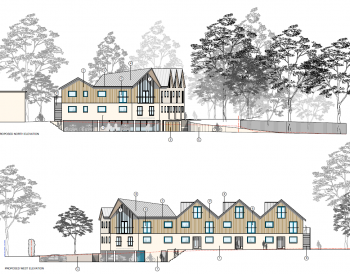 I should mention that there is a petition calling on the Council to reject the application – follow the link. As I write it has attracted 3570 signatures. Footnote: I asked the applicants’ agents for a comment on the charitable status they are claiming on behalf of their clients but have had no reply. Documents shown or linked here were downloaded from the Council website on 25 and 27 October 2016 and archived on my website. Beecher Acoustics information from Companies House website 25 October 2016.